← Friday, June 5th Doors at 9pm, $10 cover.Strange For Hire brings New Orleans an evening of the oddest acts money can buy, starring Donny Vomit, Frankie Sin, with very special guest Erik “The Lizardman” Sprague! AllWays director Dennis Monn presents a monthly cabaret/burlesque show featuring a live band performing some of your favorite Broadway tunes! This month features music from 3Penny Opera, Rocky Horror Picture Show, Hedwig & the Angry Inch, Chicago & more…. 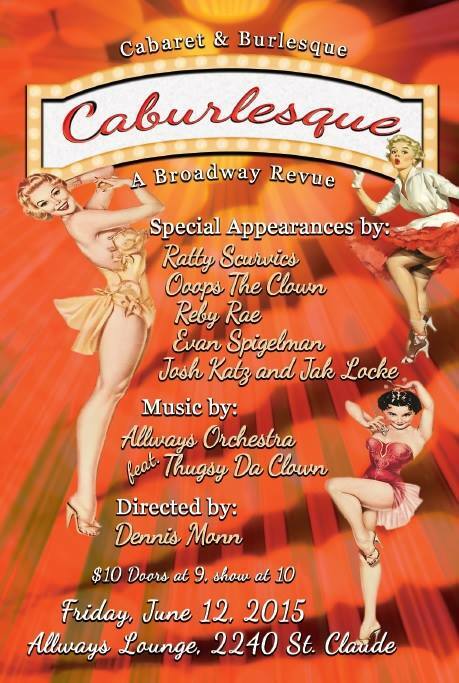 featuring AllWays alums Ratty Scurvics &Ooops the Clown & the debut of the AllWays Orchestra!